Start with some strong original music. Add in sponsored or self-labeled libations. And if the Madison-based band Mighty WheelHouse is any indication; it’s the beginning of a recipe for long-term success. Frank Busch (vocals, guitar, harmonica), Nic Adamany (vocals, guitar), and Joel Brantmeier (drums) from Mighty Short Bus; Kenny Leiser (vocals, fiddle, guitar) and Mark Noxon (vocals, bass guitar) from The Lucas Cates Band. And Mighty WheelHouse has wasted no time. The group’s first CD, The Comeback, was released in November, 2013. It’s an all-original mix of a little bit folk, bluegrass, Americana, and country. But they’re already back in the studio working on a follow up album. There have also been shows. The former bands averaged 200+ a year. Mighty WheelHouse may easily break the number after kicking off its efforts over the summer, traveling throughout Wisconsin, the Midwest, Western, and Southern parts of the country. Spoetzl Brewery in Texas, and its ‘Shiner Bock’ brand of beer sponsored 35 dates. Tours are in the works for 2014, along with an invitation to play the “Shiner Big One” at South by Southwest in Austin in the spring. 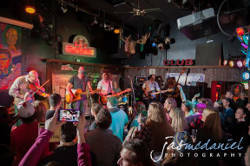 Before that festival, the band recently learned they’ll be headed to Nashville to compete for a spot on a national TV show in the production called, “American Talent Hunters.” Mighty WheelHouse beat out thousands of others to make it into the top ten finales scheduled for January 25, 2014. But why just market your music, if you can have your own whiskey? The band’s been working with a distiller, and “WheelHouse Whiskey” is expected by the end of the year. Maximum Ink: What’s your musical background? Frank Busch: My brother, father, uncles, cousins, grandfathers were all musicians, bandleaders. My brother is now a high school band director in Northeast Wisconsin. I played saxophone, but quit in 8th grade. I didn’t play guitar until college. Kenny Leiser: My parents are music educators so there were many instruments around for me to experiment with and play. I started with 4th grade strings, and added guitar in 8th grade because I thought it was cool. Nic Adamany: My dad has been involved in the music industry and is an excellent keyboard/piano player, so I started with piano when I was 5-years-old. But when I was 11, I got the surprise of a guitar for Christmas and instantly fell in love with it! Mark Noxon: My dad was a band director, and I started on drums, then clarinet, saxophone, and finally the bass when I was 13. I’ve played in a big band and jazz band, but have had my own bands since middle school. Joel Brantmeier: My parents loved music and luckily it wore off on me! I got a miniature smurf drum set when I was 4 or 5, but quickly upgraded after it. MI: When did you decide music could be a career? FB: I made it my goal 8 years ago, but the first thing I did was save for an emergency fund. It has long since been depleted! KL: I became a full-time musician in 2007 by playing enough gigs to leave my job at a music store. NA: There’s been many twists and turns, but I knew when I learned to play guitar and started writing songs, this is all I wanted to do. MN: As a bassist, I’ve been fortunate to fall into some really great projects, but never planned to be a full-time musician. I had a low-level management job when I was asked to join The Lucas Cates Band and realized I could make the same money by playing in a band and teaching bass, so I jumped on the opportunity. JB: It’s always just seemed like the right thing for me. MI: What about the Madison music scene—why is this home base for the band? FB: I came to Madison originally to attend the U.W. I think this band stands out because of our work ethic and our goal to put out a lot of good music. We have a residence at Come Back In every Tuesday, and I am playing most Wednesday nights at Claddagh Irish Pub, now. Great way to build support by growing your home audience. KL: I am content calling Madison home for now. I’ve built the bulk of my career here, since coming to play in my first band with Mark more than 11 years ago. NA: I was born here, and feel fortunate to have gone to U.W. Madison. My career really got going with Mighty Short Bus and it’s made sense to stay here. Now, I’m with a band where we will do whatever it takes to bring our music to the people. And the amount of time we are collectively putting into this project will make anything possible. MN: I came here with Kenny, and a band called Lost Between. We heard Madison was one of the best music scenes in the Midwest. I’ve stayed because of the opportunities. And I think WheelHouse stands out because of our talent, experience, and the hard work we are putting into this project. JB: I just love southern Wisconsin, in general. And I believe we’ve all spent many years working towards our current levels of proficiency, so I believe WheelHouse is the coming of age in our music careers. MI: Are you happy with your new project? FB: You have to have good energy to create good music. I think with this lineup we have created a spark to ignite a movement. KL: I am extremely happy and there is a ton of potential with WheelHouse. We’ve barely scratched the surface, so I’m excited to see what comes next! NA: The sky is the limit! And I am beyond happy with where I am and with this new band. MN: To say I’m excited is putting it mildly. I am in a situation where my goals are the goals of the band. It’s already like winning the lottery. JB: Very happy, with my career and the new project. MI: How’s the fan reaction to WheelHouse, and the end to two other popular bands? FB: The response has been overwhelmingly positive. I think we provide for each other some elements that may have been lacking, but there’s also a higher ceiling of expectation. KL: There are fans who are missing our previous bands, but I am confident they will enjoy the people and music of WheelHouse. NA: The reaction has been quite positive and for those who are skeptical, I would say see our band live. You will understand why we have embarked upon this project. MN: So far, so good. We came from two very well-supported bands and there will be some fans who might take awhile to give WheelHouse a chance, but there’s nothing wrong with that. I hope they realize we are the same musicians and more importantly, the same people from our past projects. JB: I think the reaction is great! MI: Do you consider this your dream band? FB: We are friends, first. And this is giving us the opportunity to work on something we feel will be amazing. KL: I think the five of us coming together is actually a natural evolution. And with the opportunities ahead, it makes sense individually and as a group. NA: There is a collective, positive energy to this group. I want people to hear the new CD and see us live. MN: I am working with people who are my friends, but also share the same passion for music. JB: It is MY dream band. MI: What do you want people to know about WheelHouse? FB: It is our goal to have something new for you to see, feel, hear, and taste as often as possible. Only boring people get bored. We will never get bored. KL: I hope people love what we do, and maybe even end up inspired. NA: We are an all-in band; all business, and all fun. And we are proud to write and play great music for you. MN: This is it. This is do or die. We are putting all of our efforts into landing ourselves and Madison, Wisconsin on the great musical map. JB: Look out! Here we come! MI: You’ve all won awards for your music, but what makes you most proud (right now)? FB: Well, personally and with Mighty Short Bus, there’s been some runner-up awards. So I would have to say so far, winning the Project M contest was a highlight. KL: I’m proud to be doing what I love. You can’t put a medal on that. NA: I am most proud, but also humbled, that the music I help write, create, and perform brings a little happiness to people. It is truly an awesome thing! MN: I am proud I’ve been able to support myself as a musician. No one has to come see a band, so it’s a decision people make, and having people around the country coming out to see and support us—I don’t take it for granted. JB: I am proud of my Ludwig endorsement. MI: Do you have an experience, good and/or bad, you can share? FB: I think we’ve all experienced the full spectrum of the music scene and business. There’s no rush like playing for thousands of people, but not much that’s more depressing than playing for no one, or no one who cares. KL: I had my fair share of experiences while touring with The Lucas Cates Band. The ups and downs of being on the road are unique. And for all of us in WheelHouse, I consider us road warriors. NA: My best experiences involve the people and friends I’ve made over the years. And after playing more than 1500 shows, it’s hard to single out a few, so I think getting to meet people from all walks of life is special. And I think the best onstage moments are yet to come. MN: I’ve played a crowd of 3,000 in an amphitheater, and 4 people in a dive bar. I’ve been caught in thunderstorms, stranded at the side of the road, hung out with famous musicians, and been penniless. But the best experiences will never be topped, and involve making and keeping great friends all along the way. JB: I recently hit myself in the face with a drumstick during a solo onstage. It happened while a couple of other drummers watched. Real smooth. MI: Anything your friends or fans may be surprised to learn about you? FB: At this point, I’m not sure anyone would be surprised by anything they learn about me. KL: Some people may be surprised to learn I am a professional gum chewer. I can chew gum with the best of them. NA: Maybe people would be surprised to know I listen to classical music in my car? It’s not a great rock and roll answer, but it’s all I’ve got! MN: I’m really into baseball. If I wasn’t playing music, I’d be working in baseball somehow. Maybe in broadcasting? JB: Will anyone be surprised to know I have a thing for motorcycles?